for their assistance has been stolen. Dr. Bill Smith, 22 Year veteran: I held posting this article until after Memorial Day. 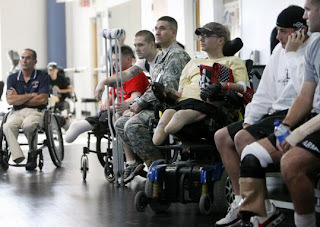 The following disgusting situation affects living veterans verses our fallen comrades whom we just honored. In summary, Arkansans have been shorted $780,000 in mismanaged or vanished money at the Arkansas Department of Veterans Affairs! Which begs the question, have Veterans been swindled of benefits, hurt, ignored or possibly worse? The following video by "Americans For Prosperity - Arkansas" reports on the mismanagement which has occurred at Arkansas Dept. of Veteran Affairs. While this type of situation has occurred (or may be occurring) at many levels of Government, it is most outrageous that it happened with funds dedicated to veterans. Governor Mike Beebe may have aided his cronies in the past thus ignoring his constituents in general. However, in this situation, he has specifically failed veterans - the men and women who served our great Nation and State. Note also that Gov. Beebe is also the Commander in Chief of the Arkansas National Guard. There appears to have been no apparent attempt by the governor to address or punish anyone for the missing $780,000. Unfortunately, Governor Beebe has allowed the Director of the Arkansas Dept. of Veteran Affairs to resign with full retirement. This in military terms is an epic FUBAR! Our Veterans, their families, and Arkansas Taxpayers deserve better. For now, we can only wonder if and when we may ever get answers and an accounting from Gov. Beebe, our former chief law enforcement official (Attorney General). I am very concerned with this "culture of mismanagement." Have Arkansas veterans and their families experienced or may they yet experience real physical harm or loss due to a lack of responsible or available services? Has the Governor and therefore the State of Arkansas negated its responsibility of oversight, accountability and protection of Arkansans? As fellow Arkansas Veterans, we need to join all other Arkansas citizens in demanding an accounting for these lost / misappropriated funds. This is not a political issue, and there is no time-limit on holding elected officials accountable! We must not forget, please share this information, and join me in holding our Governor accountable. We must protect the resources for our veterans. Your expse' of "Swindling Veterans" was excellent! Questioning the Govenor, using known facts and not misusing facts as many do displayed your good commuinication skills. $580,000 illegal fees paid to an Arkansas government bureaucrat. Does anyone care about this situation????? You bet your bippy the veterans do. Our comrades have been offended, affronted, and short changed by scoundrels and thieves. Anyone who would swindle money meant to operate programs for veterans who really need help; and those in the 'veterans' home' charged more than they were supposed to (in affect stealing from these veterans) should be tried and sent to jail. @arra I am appalled at what happened at the Dept of Vet Affairs. A full investigation needs to be done. Our vets deserve no less. AR Senate Legislative oversight is my job. I assure you, I will be prepared to address the Swindling of Veterans. You bet. Prepared to address the Swindling of Veterans as you detailed. Yes Sir. Will help address the Swindling Veterans at The Arkansas Department of Veterans Affairs. I am aware of the problems that have been reported, and my staff and I are in regular contact with the AR VA. Cheating veterans ticks me off! Veterans are used to being at the bottom of the pile in Arkansas. The Arkansas tax on Charity Bingo was devastating to Veterans' Programs and even forced the Fairfield Bay American Legion Post to sell its building. Can you imagine a group of WWII Vets running Bingo and helping the community, giving scholarships, sending boys to boys state, supporting American Legion Baseball, etc and then the state slaps on a tax that takes virtually all the funds? Then the 5 people hired by DF&A, the BINGO POLICE, show up and drag these volunteers through the muck as if they were a Wall Street Firm? WE MUST HAVE A CHANGE OF ADMINISTRATION IN ARKANSAS. We have the highest per capita taxes in the south and the 7th highest sales tax in the country while being at the bottom in per capita income. Industry is fleeing the state. Arkansas has 20,000 more state employees than Kansas that has almost the same population and is larger in area. I CARE! Sen. Irvin, Thank U for the update & being concerned about #veterans -- what is an "ISP" (by Rep. English). No reply from my Senator or Rep.
Why isn't there more outrage in Arkansas about almost a million dollars simply disappearing from Arkansas Dept. of Veterans Affairs and no one is held accountable?? The same state that is mismanaging our funds wants to raise our taxes AGAIN?!?!? The Governor and his staff would like to hear your comments. Your message will go directly to the Governor or to the appropriate staff member. Didn't Beebe also say that there was left over funds (around a million also?) from the budget that would be used for government salary increases and bonuses? = / ???? How many veterans in Arkansas voted for Beebe believing he was a "conservative" Democrat? Is this ok with them? Thank you for getting involved in addressing this rip off of Arkansas veterans.